A unique summer party under the rhythms of David Morales has been successfully held on Sunday, July 27 at Cariocas beach bar on Schinos beach at Alepochori. The famous DJ fans as well as everybody who was at Schinos beach on Sunday enjoyed wonderful moments under the rhythms of David Morales. 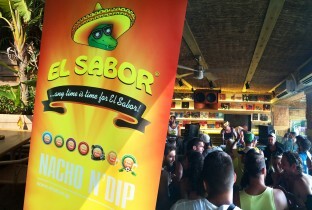 El Sabor supported the glamorous event by accompanying the summer party with its unique flavors! The habitues enjoyed the music of David Morales alongside with the delicious flavors of El Sabor! Special stands were set up at the party and everyone tasted El Sabor nachos of all flavors! So, it was double delight for those who were in Cariocas beach bar in Alepochori on Sunday, while David Morales raised the spirits soar with his musical choices, El Sabor accompanied them in the best way!